the area that later became the Prussian province of Posen. who became ensnared in the Holocaust and did not survive. was desecrated, burnt and destroyed by notorious Nazi elements of Schneidemühl. 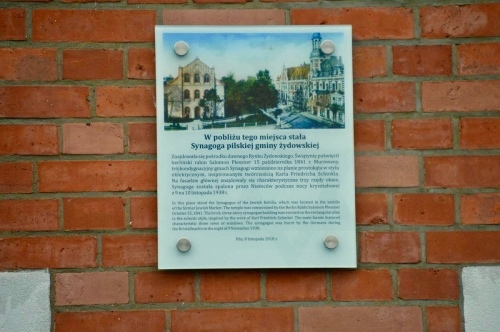 "In this place stood the synagogue of the Jewish kehila, which was located in the middle of the former Jewish Market. The Temple was consecrated by the Berlin Rabbi Salomon Plessner, October 15, 1841.
inspired by the work of Karl Friedrich Schinkel. The main facade featured characteristic three rows of windows. 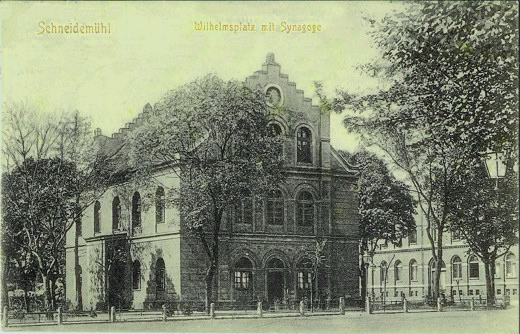 The synagogue was burnt by the Germans during the Kristallnacht on the night of 9 November 1938." "Piła, 8 listopada 2018 r."
their town Snyde-Mole, Schnyde-Möhle, or Schneyde-Mühle. town of Piła by the Prussians in 1772, after their annexation of the area. meaning ‘saw’ — referred to a place where rushing water powered a device used for sawing wood. The word Schneidemühl is a literal translation from Polish to German. the Jews of the area simply wrote the name of their town פילה in Hebrew letters. seven generations of this webmaster's ancestors, the Simonstein family. at Yad Vashem, on the Mount of Remembrance in Israel. is commemorated here in stone, together with others of Pomerania, Posen and West Prussia. What happened to the Jews of Schneidemühl during the Nazi period? Is there a Yizkor book for Schneidemühl? How large was the Jewish community in its heydays, and before the Nazi period? By the late 1920s only a fraction remained. 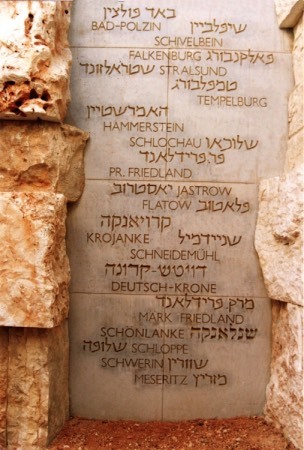 Are there any Landsmannschaften for the Jewish community of Schneidemühl? No. Landsmannschaften were rarely formed for communities that used to be located in the former Prussian province of Posen. What is the current name of Schneidemühl? Since the end of the Second World War the town, situated in the province of Wielkopolskie in north-western Poland, is known again by its original Polish name Piła. Are there any extant Jewish birth, marriage or death records available for Schneidemühl? With more research they might still be located in Polish or German archives. Where can one find any civil birth, marriage, death records of Schneidemühl? with this period of the Holocaust. terrible events that occurred in Stettin — those actions were NOT carried out together. A full account of these events can be found in the book below. 7" x 10", hardcover, 390 pp. true history of this 300-year-old community. also given a detailed description in word and picture of the Tempel, the once splendid synagogue of Schneidemühl. most members of this Jewish community — as it existed in the 1930s — could be traced. The chapter Z'Chor features chronologies of all those who were caught in the Nazis' web. Here their fate is documented in detail to ensure that their memory is preserved. are just some of the many archival records found in this work. this book brings back to memory a once notable, vibrant and sizable Jewish community. 9.5" x 6.5", hardcover, 510 pp. Links to external websites are provided in good faith and for information only. Disclaimer: no responsibility for materials contained in any website linked from this site. it is open to Sephardim (descendants of Jews from Spain and Portugal), Mizrachim (Jews from Asia) and Jews from other places as well. This site is hosted at no cost by JewishGen, Inc., the Home of Jewish Genealogy and may be linked to. However, no part or text of this site may be copied in any way without the webmaster's permission. your JewishGen-erosity is greatly appreciated.